One of the major roles of the conservation division in the National Archives is to facilitate requests from researchers for copies of documents. Many of these requests are from private researchers or from film and documentary production companies. Last year, Freya Clare Smith and Dr Hugh Denard, from the Lost Theatres project, approached the National Archives, with what was definitely an unusual request. 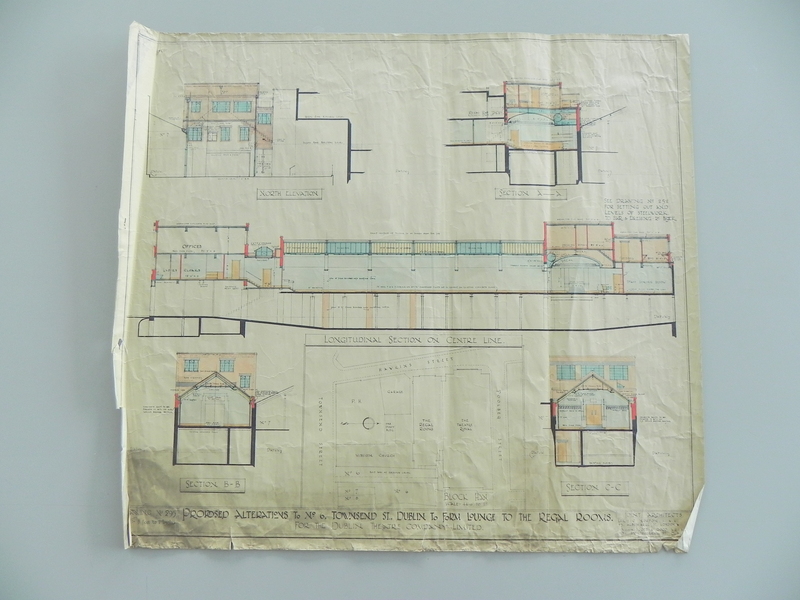 Earlier that year, Freya had located a treasure trove of previously uncatalogued original architectural plans relating to the Theatre Royal, Hawkins Street (OPW/5HC/4/955/1-27) in the National Archives. These plans proved to be invaluable evidence for the project, which aims to digitally reconstruct historically accurate ‘lost’ theatres using original source material. 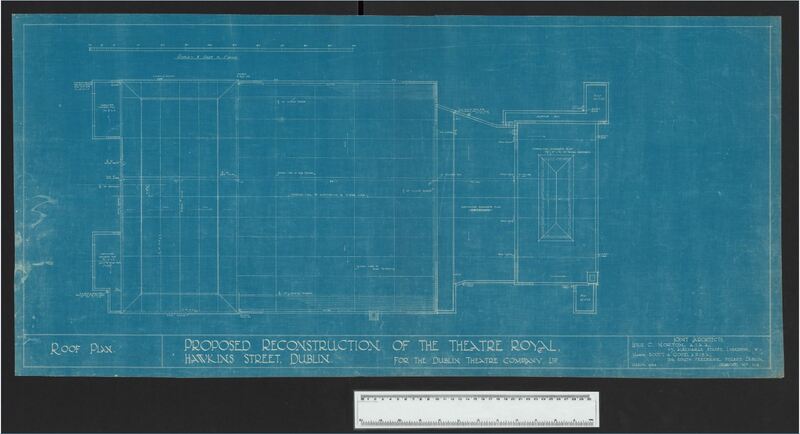 The conservation of these plans would enhance the extraction of information from which to model the third Theatre Royal and preserve them in good condition for future generations to come. An architectural photo reproduction is a copy from an original drawing that has been prepared using a method similar to the photographic process when one side of paper is coated with a light-sensitive material. A wide range of prints can be termed as photo-reproductions, including: Blueprints, Vandyke prints, Ferogallic prints, Aniline prints and Diazotypes. These were used by architects and planners in the first half of the twentieth century. This collection of architectural plans consisted of 13 blueprints and 14 diazotype prints. 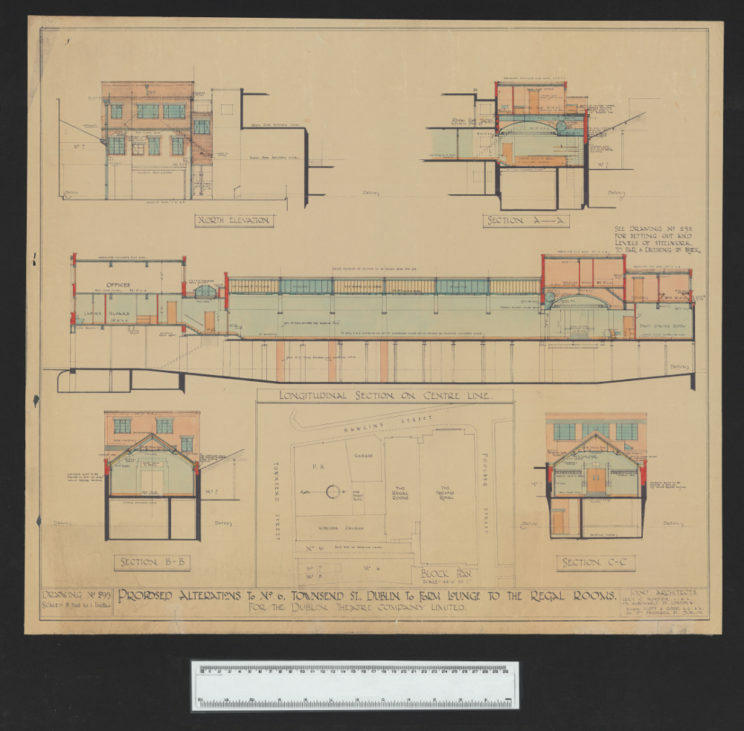 The process for blueprints was developed in the 1870s and continued to be used extensively until the 1940s. These plans are negative images: white on a Prussian blue background. The intensity of the blue colour differs slightly because of variations in the iron-based chemicals used, exposure time, and any light damage that may have occurred since manufacture. Blueprints are very light sensitive and fading can occur very rapidly. The blue colour can also turn brown in alkali conditions, which tends to happen at the edge of plans. 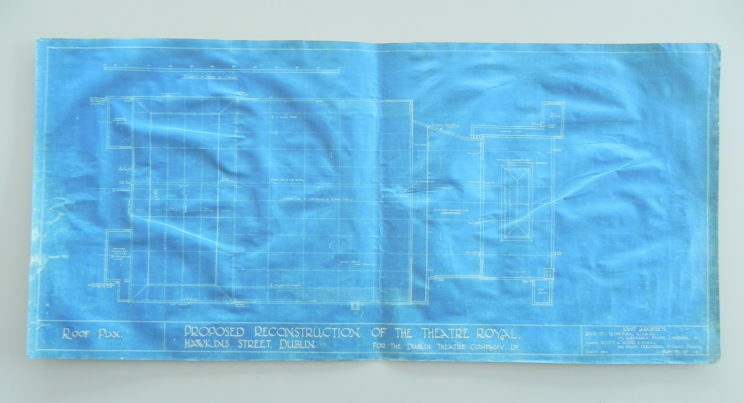 A pre-conservation blueprint of the Roof Plan of the Theatre Royal. OPW/5HC/4/955/9 – DWG No. 118. Diazotype reproduction prints are positive prints and with brown lines on a flecked white background. This process was invented in the 1880s and was widely used in the early 20th century, surpassing the blueprint as the reproduction technique of choice since it was cheaper to produce. The diazotype prints in this collection are beautifully coloured with watercolours. In the diazotype process, one side of the paper is coated with a diazo salt and dye. The sensitised paper is placed beneath the original drawing and exposed to ultraviolet light. Where there are no marks, the light is not blocked and the light sensitive diazo compounds break down and are rendered colourless. In the areas where the drawing lines are, the light is blocked and the diazo compounds remain intact, forming an image when developed. The image was developed by passing the print through rollers and exposing it to ammonia vapours. The advantage of this dry process was that it was quick to use and there was no distortion to the paper after the process. The print was not washed, however and some chemicals remained in the paper, these are thought to be the major factor in the degrading of diazotypes. A pre-conservation diazotype print of plans for a proposed lounge to the Regal Rooms. OPW/5HC/4/955/26 – DWG No. 295. To allow Freya to create the 3D architectural model, the plans were required to be as flat as possible. Removing the planar distortions such as folds and creases from the plans, as well as repairing tears, were the major objective of the project. After the initial assessment of the condition of the drawings, the surfaces of the plans were cleaned with a sponge made of vulcanized latex, which is favoured by conservators working with archival and library collections. The sponge picks up and absorbs the dust, but does not transfer the dirt to another area; the sponge is non-abrasive and does not leave damaging residues on paper. The paper that the plans were produced on was thin and quite hydroscopic. During the conservation it was observed that the paper relaxed on the back quicker than on the front, probably due to the method originally used to produce the plan. A typical method used to introduce moisture to paper is to spray a fine mist of water onto the document. Whilst spraying the blueprints presented no problem, there were concerns about spraying water onto the front of the hand-coloured diazotype prints, as too much water can cause the watercolours and inks to feather and bleed. A solution was devised by placing a damp sheet of Bondina (non-woven polyester) on the front side of the plan, which was then brushed over with a Japanese smoothing brush; this provided enough moisture to humidify the front of the plan. This action resulted in a controlled introduction of moisture and resulted in no feathering or bleeding of the watercolours or inks that had been used to annotate the plans. The lightly dampened plans were then placed between a sandwich of dry blotters and boards and placed in a custom made extra-large hydraulic press. The prints were left in the press overnight and the results were excellent. Small tears were repaired using 15-20mm-wide strips of a very light, 4gms (4 grams per square meter) tissue, coated with tapioca starch and placed on the underside of the plan to close the tear. The repair tissue was then smoothed in place with Teflon bone folder and dried with heated spatula using 30gsm Bondina as a barrier to the heat. This was to ensure that the moisture levels were kept to a minimum to reduce the risk of distortions to the sheet. A post-conservation diazotype print of plans for a proposed lounge to the Regal Rooms. OPW/5HC/4/955/26 – DWG No. 295. Kissel E. & Vigneau E. Architectural Photo reproductions: A Manual for Identification and Care, Oak Knoll Press, 2009.